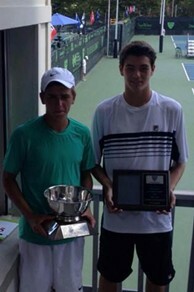 Scottsdale's Nathan Ponwith, 15, had quite a run at one of the biggest tournaments of the year, the USTA Boys 16 National Tennis Championships in Kalamazoo, Mich., winning eight singles matches and placing fifth overall. Ponwith entered the tournament seeded 21. He got a bye in the first round, then won three matches in the main draw to reach the Round of 16. In the 4th Round he played 5th seeded Taylor Fritz of Rancho Santa Fe, Calif. and won in straight sets 6-4, 6-2. He then fell to 9th seeded Reilly Opelka of Palm Coast, Fla. 6-3, 6-4. But Ponwith wasn't done yet. He fed into the 5th Round of the consolation bracket and fought his way through five matches to place fifth. He beat seeds higher than him in four of his five consolation matches, including another win over Fritz. Ponwith and Fritz faced off again in the finals of the consolation, with Ponwith taking the win 6-3, 7-5.